Can your child round numbers to 100, count back change correctly, interpret bar and picture graphs, and make equivalent fractions? 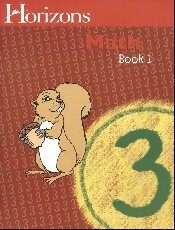 With Horizons 3rd Grade Math Student Book 1, he'll master these math concepts and more! This student workbook contains colorful lessons 1-80 with 8 review tests. Pages perforated for easy removal. From Alpha Omega.